The astrological sign of Pisces is represented by twin fish swimming in opposite directions but united by a slender cord. One fish symbolizes Aphrodite and the other her son Eros. The goddess of love and the god of desire disguised themselves as fish to escape the sea monster Typhon. Their tails were tied together so they would not lose each other as they dived into the depths of the ocean. Those born under the sign of Pisces swim in two opposing worlds; the realm of the spirit and reality. 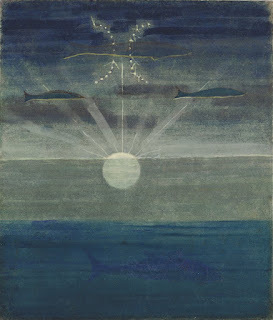 Lithuanian painter and composer Mikalojus Konstantinas Čiurlionis (1875-1911) captured the mystical element of the fish in his The Sun is Passing the Sign of Pisces. The gods of love and desire are revealed in German Renaissance artist Lucas Cranach's (1472-1553) painting Venus with Cupid who Stole a Honeycomb. 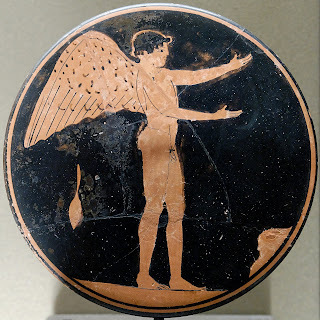 The naughty god is seen alone on a piece of red figure pottery. Happy Birthday to Greg McIntyre and Jim Gallagher!